This view of downtown Los Angeles is taken from Interstate 110, the Harbor Freeway, on a day free from smog and haze that can clutter this world-famous view. 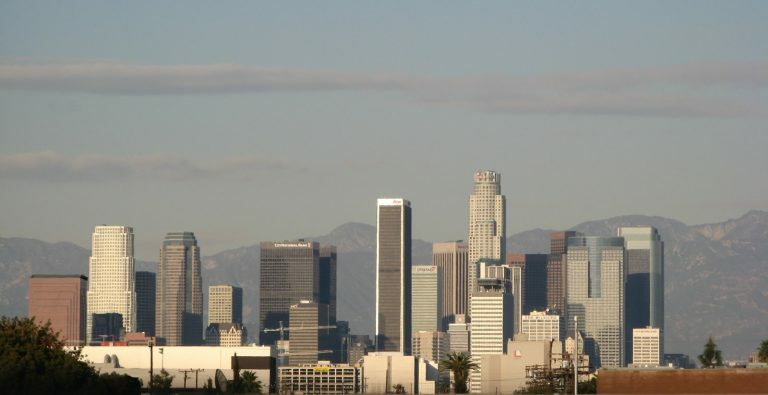 Commonly seen in movies, the skyline of downtown Los Angeles is dominated by the tall U.S. Bank (Library) Tower, which rises 1,018 feet above street level. Photo taken 01/14/07. Los Angeles, known also as “The City of Angels”, represents the second largest metropolitan area within the United States. Commonly referred to as L.A., Los Angeles is also the largest city in California and has a population of 3,694,820 people as of the 2000 Census. Los Angeles is a chartered city with a mayor-council form of government, consists of 498.3 square miles (including 29.2 square miles of water), was founded on September 4, 1781, and was incorporated on April 4, 1850. Los Angeles is truly a city of villages, with many diverse communities and cultures spread throughout its areas. Tourism is a huge business in L.A., and there is plenty to keep any visitor occupied. 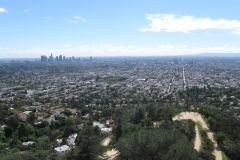 Hollywood (the entertainment capital of the world), beaches, mountains, Griffith Observatory, cultural events, education (including prestigious University of California at Los Angeles [UCLA] and University of Southern California [USC]), industry, and climate keep people visiting. To enable incredible growth through the 20th Century with limited water resources, the Los Angeles Aqueduct and State Water Project brought fresh water to an otherwise arid region, although not without controversy that continues to this day. Controversy is nothing new to a city this large. With a multicultural environment, tensions sometimes erupt, as they did in the 1965 Watts riots and 1992 Rodney King riots. A recent initiative to split the city into San Fernando Valley and Los Angeles failed, and it appears that it will remain a unified city for some time to come. Interstate 5 is the major north-south route on the West Coast. It enters the Los Angeles Basin from the northwest, following the Historic U.S. 99 corridor over the Grapevine and through the Tehachapi Mountains toward Santa Clarita, a rapidly developing northern suburb of Los Angeles From there, Interstate 5 follows the Golden State Freeway south through the Sylmar Interchange (with California 14 / Antelope Valley Freeway) into the San Fernadino Valley. After passing through the East Los Angeles Interchange (where Interstate 5 meets California 60 and U.S. 101), Interstate 5 takes over the Santa Ana Freeway designation from there southeast to Orange County and Interstate 405. South of the Interstate 405 interchange (El Toro Y Interchange in Irvine), Interstate 5 follows the San Diego Freeway south to San Diego and the International Border with Mexico. Interstate 10 follows the Santa Monica Freeway from its beginning at California 1 (Pacific Coast Highway) near the McClure Tunnel in Santa Monica east to downtown Los Angeles. After a brief overlap with Interstate 5 through the East Los Angeles Interchange, Interstate 10 proceeds east along the San Bernardino Freeway toward San Bernardino, Palm Springs, and eventually Phoenix. The Santa Monica Freeway, which suffered a collapse of an elevation section during the Northridge Earthquake of 1994, is often considered to be one of the single busiest freeways in all of Greater Los Angeles. On the east side of downtown, Interstate 10’s El Monte Busway serves high occupancy vehicles with three or more passengers as well as buses with a separated, dedicated carriageway just for those vehicles entering downtown. Interstate 15 is a major north-south route through the Inland Empire (Riverside and San Bernardino Counties). This freeway mostly replaced U.S. 395 from Hesperia south to San Diego (except for the segments directly replaced by Interstate 15). The busy highway serves as part of the Los Angeles to Las Vegas corridor, providing a direct route to southern Nevada from Interstate 10 (San Bernardino Freeway) and California 60 (Pomona Freeway). Interstate 15 continues as a heavily traveled route through Ontaro, Coronoa, and Lake Elsinore en route to San Diego County. Interstate 105 travels the Glenn Anderson (Century) Freeway from El Segundo (near Los Angeles International Airport [LAX]) east to Interstate 605. A final extension of Interstate 105 east through Norwalk to Interstate 5 (Santa Ana Freeway) was canceled due to community opposition. The Green Line light rail corridor (Metrorail) follows Interstate 105 nearly the entire route, mostly in the median strip. With the distinction of being one of the busiest freeway in the United States, Interstate 405 (San Diego Freeway) provides a busy commuter and regional traffic route through west Los Angeles, Inglewood, Carson, and Orange County. The San Diego Freeway was to be the preferred through route between the San Fernando Valley and San Diego, but the rapid population growth of the Los Angeles basin overwhelmed the freeway and Interstate 405 now carries over 300,000 vehicles a day through sections between Interstate 105 and U.S. 101 (Ventura Freeway). Formerly signed as California 11 and briefly as U.S. 6, Interstate 110 links downtown Los Angeles with the Port of Los Angeles and Port of Long Beach. The freeway, like most others in Los Angeles, is well traveled with an elevated HOV-3 roadway toward the junction with Interstate 10 (Santa Monica Freeway). Northbound, the freeway is signed as Interstate 110 from the port north to Interstate 10; southbound, Interstate 110 signs appear at the Four-Level Interchange with U.S. 101 and proceed south to the port. Providing a northern bypass of Los Angeles and preferred trucking route, Interstate 210 straddles the southern edge of the San Gabriel Mountains through the San Fernando Valley, then turns east in Pasadena to proceed east to Rancho Cucamonga and San Bernardino. The freeway originally ended at the Kellogg Interchange with California 57, California 71, and Interstate 10 (San Bernardino Freeway), but the 210 designation was extended east on the Foothill Freeway as new segments opened through the 2000s. Interstate 210 is anticipated to be fully signed (including current California 210 segments) once the interchange with Interstate 215 is expanded to full Interstate standards. The short section of Interstate 210 between the Foothill Freeway and Interstate 10 is now part of a longer California 57 (Orange Freeway) routing. Interstate 710 is a north-south route from Long Beach north to Interstate 10 east of downtown Los Angeles. Plans call for Interstate 710 to be extended north to Interstate 210 in Pasadena, but plans have been delayed due to local opposition. Any extension would likely now require the use of tunnels and other mitigation to avoid large-scale community impact. Interstate 710 replaced California 7 (which itself was built as former California 15) in 1981, the same year Interstate 110 replaced former California 11. The highway is part of High Priority Corridor 46. A major trucking route, Interstate 710 provides the most direct route from the Port of Long Beach to Interstate 10 east of downtown Los Angeles. Interstate 215 is the former route of U.S. 395 and Interstate 15E (formerly California 194). It is a north-south freeway that begins in Murrieta and extends north to Riverside and San Bernardino. The route provides an alternative to Interstate 15 in the Inland Empire. U.S. 101 represents the only U.S. highway remaining in the Los Angeles metropolitan area. The demise of U.S. 6, 60, 66, 70, 91, 99, and 395 leaves U.S. 101 as the only U.S. route still signed. Following the Santa Ana Freeway north through the “Downtown Slot”, U.S. 101 becomes the Hollywood Freeway upon passing through the Four-Level Interchange. From there, U.S. 101 passes through Cahuenga Pass and turns west near Universal City to begin its run west through southern San Fernando Valley toward Thousand Oaks in Ventura Freeway. U.S. 101 continues west on the Ventura Freeway toward Ventura, Oxnard, and the Santa Barbara County Line along the Pacific Coast. U.S. 101 eventually turns north from there toward San Luis Obispo, Salinas, San Jose, and San Francisco. U.S. 395 brings travelers from Reno, the Eastern Sierra, and points north into Southern California. Near Inyokern, the route divides, with California 14 traveling south to Los Angeles and U.S. 395 continuing south to San Bernardino via Ridgecrest and Hesperia. U.S. 395 ends when it merges with Interstate 15 just north of Cajon Pass. California 2 follows Historic U.S. 66 through Santa Monica, west Los Angeles, Beverly Hills, and West Hollywood. After a brief pass through Echo Park, California 2 becomes a freeway and shifts onto the Glendale Freeway, which carries the California 2 designation north from Echo Park to Interstate 210 (Foothill Freeway). North of there, California 2 continues northeast into the Angeles National Forest as the Angeles Crest Highway. California 14 is the Antelope Valley Freeway leading from Los Angeles north to Palmdale, Lancaster, Mojave, and all points north along U.S. 395 in the Eastern Sierra. The highway replaced U.S. 6 in 1964 and is full freeway from Interstate 5 to near Mojave. California 22 is a major east-west route from Long Beach to Orange. The highway starts as Seventh Street in Long Beach but quickly ramps up to freeway configuration. After a brief overlap with Interstate 405 (San Diego Freeway), California 22 travels east along the Garden Grove Freeway through Garden Grove and Santa Ana before ending at California 55. California 23 begins in Fillmore and travels south to the Pacific Coast Highway (California 1) in Ventura County. A portion of the route is freeway, between California 118 (Ronald Reagan [Simi Valley] Freeway) and U.S. 101 (Ventura Freeway) in Thousand Oaks. The Terminal Island Freeway provides a short connection between the Vincent Thomas Bridge area at the Port of Long Beach north toward Interstate 405 (San Diego Freeway), but that link was never built. The section of Terminal Island Freeway that ends at Willow Street is part of California 103; the remainder of the route leading to the Alameda Corridor is California 47. Plans call for improving California 47’s connection to the Alameda Corridor to improve north-south truck and rail transit in the Los Angeles Basin. The Alameda Corridor, which is signed as California 47 from California 103 to California 91, is part of a long-proposed and still unconstructed Industrial Freeway corridor long planned to relieve Interstate 110 and Interstate 710 for transportation of goods from the port north to downtown Los Angeles. While such a freeway will likely never be built, the Alameda Corridor uses grade separations, smart traffic signals, and other access control devices to keep traffic flowing. California 55 provides a direct route between California 1 in Newport Beach, Interstate 5 (Santa Ana Freeway), and California 91 (Riverside Freeway). Most of the route is freeway except the portion in Newport Beach and Costa Mesa. California 57 is the Orange Freeway, which begins in the Orange Crush interchange in Anaheim and proceeds north to the Kellogg Interchange and Interstate 210 interchange in San Dimas. In addition to serving cities along its route, California 57 also provides a useful bypass route to the east of Los Angeles for through traffic in conjunction with Interstate 210 (Foothill Freeway) in place of the more direct but more congested Interstate 5. A briefly overlap occurs with California 60 (Pomona Freeway) in Diamond Bar causes a choke point along the route. Partially following the former routing of U.S. 60 (at least from Pomona east to Beaumont), California 60 follows the Pomona Freeway east from Interstate 5 and Interstate 10 in the East Los Angeles Interchange to Interstate 10 at Beaumont. The highway has a brief overlap with Interstate 215 at Riverside; this segment of freeway was reconstructed to accommodate more traffic in 2008. California 71 is the Chino Hills Freeway. The section of California 71 through Pomona remains an expressway with three right in right out (RIRO) intersections. Construction through 2023 upgrades this stretch to limited access standards. The north end is at the four-level Kellogg Interchange, joining California 71 with I-10 (San Bernardino Freeway) and California 57 (Orange Freeway). A substandard trumpet interchange connects an at-grade portion of California 71 at the south end with California 91 (Riverside Freeway). Future plans will add flyovers there. The first in a series of Orange County toll roads, California 73 provides a bypass route of Irvine for Interstate 5 between San Juan Capistrano and Costa Mesa. The northernmost portion of the highway was built as a freeway between California 55 (Costa Mesa Freeway) and Interstate 405 (San Diego Freeway). California 90 exists in two segments, the short Marina Freeway in west Los Angeles and Marina del Rey, and the north-south controlled-access Richard Nixon Parkway. The gap between the two highways is unconstructed California 90, and the gap freeway is unlikely to be built. A major east-west freeway through south Los Angeles County and north Orange County, the Artesia Freeway carries the designation of California 91 east from Interstate 110 to Interstate 15. The Riverside Freeway segment through the Santa Ana Canyon is one of the busiest segments of freeway in Southern California, and it carries the 91 Express Toll Lanes for carpools or those willing to pay a toll to avoid traffic. Additional improvements are planned to combat perennial traffic woes on the Riverside Freeway. California 91 replaced the routing of U.S. 91 in 1964. California 103 is the Terminal Island Freeway from the Anaheim Street interchange north to Willow Street in the port area. A planned extension of this freeway to link it with Interstate 405 and Interstate 710 was never built. California 110 continues the Interstate 110 (Harbor Freeway) north of Interstate 10 (Santa Monica Freeway) as the Pasadena Freeway. Historically, California 110 consists of the Figueroa Street Tunnels and Arroyo Seco Parkway, which provided the first freeway in Southern California (connecting downtown Los Angeles with Pasadena). The substandard and historical nature of the freeway relegates the highway as a state highway, including the historic tunnels built in the 1930s. After following the Arroyo Seco northeast, California 110 transitions directly onto the Arroyo Parkway in Pasadena, and the Arroyo Parkway (which used to be signed California 110 but now is a city street) connects with Historic U.S. 66 (Colorado Boulevard). California 118 stems west from Interstate 210 (Foothill Freeway) in the San Fernando Valley into the Simi Valley northwest of Los Angeles via Santa Susana Pass via the Ronald Reagan Freeway. California 133 starts as Laguna Canyon Road, an expressway that leads north from Laguna Beach toward Irvine. At the Interstate 5 interchange, California 133 shifts from a freeway to a tollway. California 133 then links with California 241 as a toll road (this is the second of four toll roads in Orange County). California 134 carries the Ventura Freeway east from the U.S. 101 and California 170 (Hollywood Freeway) interchange near Cahuenga Pass and Universal City to Interstate 210 (Foothill Freeway) in Pasadena. The Hollywood Freeway continues north of the U.S. 101 and California 134 (Ventura Freeway) interchange as California 170, which travels north for a few miles before merging onto northbound Interstate 5 (Golden State Freeway). California 241 is a third toll road, which serves the growing eastern suburbs of Orange County through Rancho Santa Margarita, Mission Viejo, Lake Forest, and Irvine. The toll road skims the western reaches of Santa Ana Mountains between Oso Parkway and California 261 (Eastern Transportation Corridor) at present. A southern extension to Interstate 5 near San Clemente is planned by the toll road agency, but the extension has met harsh criticism and was denied twice in 2008, once by the California Coastal Commission and again by the U.S. Federal Government. New alternate corridors linking Interstate 5 with California 241 are being considered in light of the controversy of connecting the two roads near Trestles Beach near San Onofre in San Diego County. However, it is likely that any proposed extension of California 241 will be subject to intense public scrutiny. The fourth of the Orange County toll roads, California 261 links Jamboree Road and Interstate 5 (San Diego Freeway) with California 241 in Tustin. Photo gallery covering various streets, roads and points of interest throughout the Los Angeles region in Southern California. Page Updated May 6, 2012.